Splitting starts initially with Randall Telfer at tight end at USC, Xavier Grimble declared as a junior for the 2014 NFL draft. He finished with 69 receptions for 731 yards and 11 touchdowns. 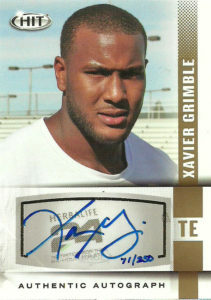 Going unselected, Grimble has seen times on the practice squads of the Giants, Patriots and 49ers in 2014, before landing on the roster of the Pittsburgh Steelers in 2015, where he made his 2 first professional catches and his first TD against the Bengals in 2016. He finished the season with 11 catches for 118 yards and 2 TDs. He’s expected to make a run for the starting tight end position in Pittsburgh going into 2017.